Thoughts on being the second, the younger, the youngest: it makes you watchful. It makes you calculate. It makes you compare. 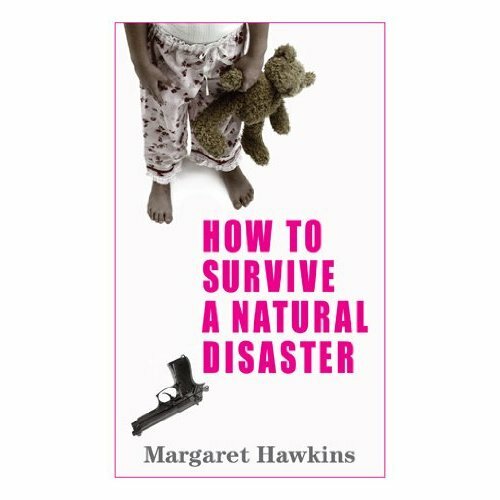 Margaret Hawkins exquisitely details the unraveling of a disharmonious family in her second novel How to Survive a Natural Disaster. The story revolves around May, an adopted Peruvian girl, who doesn’t speak and is considered rather odd. She’s babied by her mother Roxanne and she idolizes her older sister April who excels at everything and wants nothing to do with her bizarre adopted sister. Roxanne has moved on to her second marriage with the troubled artist Craig who cheats and dabbles in various piece-meal jobs. Roxanne never had the successful art career she wanted so she married into wealth the first time around and had April. Now she clings to May in an effort to keep her family intact. April is the perfect child whose wealthy father gives her anything and everything she wants. April is also a little girl with a secret eating disorder. Hawkins tells the story from the viewpoints of May, April, Roxanne, Craig, Mr. Cosmo (the pet Weimaraner) and Phoebe, their agoraphobic neighbor. Hawkins presents this riveting story with astute observations, dark humor and honesty. Using different narrators to reveal memories makes for a stimulating and insightful read. How to Survive a Natural Disaster is an astute family drama filled with betrayal, envy, lies, discord, tragedy and forgiveness. It packs a real punch and will stay with you for days after you finish its last page. This entry was posted on September 2, 2010, 17:38 and is filed under Books. You can follow any responses to this entry through RSS 2.0. Both comments and pings are currently closed.